It’s astounding: big brands, with seemingly bursting-at-the-seams marketing budgets, gobs of support, and likely further agency support from various vendors, still produce lackluster Facebook ads. The great news is, many small- to mid-sized business marketers can still eat big brands’ lunch in many ways if they are über nimble, fast to adapt, and understand what makes the most impact in various channels. Some big brands are downright failing when it comes to Facebook ad images and copy. In a visually rich, fast-moving, content-saturated environment images in Facebook ads are the first element that disrupts the user enough to pay attention to your ad. Here we’ll feature big name brands, their disappointing Facebook ads, lessons to be learned, and what they could do different. After that, we’ll highlight some brands and their ads that are screaming off of Facebook. No doubt, it isn’t easy to showcase an entire gown in a 100×72 pixel image which is the precise reason you shouldn’t. Neiman Marcus also gets knocked points for grammatically incorrect, boring copy. Snooze. Loft is in the same boat as Neiman Marcus, vertical images in Facebook images just don’t resonate and it’s best to steer clear of them altogether if you can. Kudos to LOFT, though, for the fun inspired body copy. New dress and take the weekend off? I’m game! But I barely even looked at the copy because of how un-interesting the image was. Moral of this story: vertical images just don’t resonate well in a landscape template that’s teeny tiny. Instead, highlight the fine details of a dress with a variety of ad images. Not only will this keep images fresh and different, it will more accurately highlight the quality and style of the pieces. Let’s face it, the images in both ads, that are supposed to capture a user’s attention (and heart!) is so small, far away, with zip for detail these may have come from a Kmart catalog. First, the image is only text, which, if that’s your tactic, cool, but Facebook is cracking down ads in news feed with images that have 20 percent or more text. Traditional ads are getting a pass on this for now. So, just be careful! Second, the text in the image is exactly the same as the headline. I understand the power of repetition, but this is a wasted opportunity. On top of this, Weight Watchers has celebrity endorsers whose contracts likely stipulate their likeness can be using to promote the product. Shots of Jennifer Hudson or Jessica Simpson would break through the noise of Facebook better than text-laden images. Third, it’s blue, so is Facebook. Best practices suggest using contrasting colors to Facebook’s own design. This is difficult to overcome if your big brand is a stickler for style guidelines and won’t allow deviation. 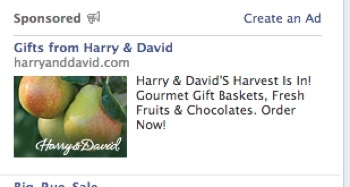 It’s cool to see Harry & David use FBX! These ads were seen moments after browsing and leaving the website. On its own, the ad is not too shabby, but some marketers may have been asleep at the FBX advertising wheel. This looks like a generic ad – and clearly they aren’t using all that FBX has to offer to their advantage! With FBX you can generate ads from cookies across your site, so product/page specific cookies will result in product-specific ads on Facebook, which is more compelling. Harry & David could have learned a lot from my click-path where I browsed “Gifts Under $50,” the remarketing team can gleam from this visit that I will be a frugal customer for my first purchase. That image looks like he’s the wanted one, because this girlfriend would like a smilingphotograph of a potential suitor. Oh, smiling isn’t cool? Well, then perhaps I’m just not the right market. I’m also more than off-put by the messaging. Test messaging here. Not every woman wants a man to “take care of” her. To be fair… I just saw a new Facebook ad for BlackPeopleMeet! Looks like they are adding in some smiling faces (much better!) and testing messaging. However, a fresh pair of eyes on ad copy before launch is a good thing. I happen to generally know what a Dodge Durango looks like, but the logo here isn’t going to compel me to click on the ad where as a picture of a hot car would. This is another case of snoozer ad copy. Disappointing on all fronts, Dodge, disappointing. If GM’s Facebook ads were anything like this, then no wonder they weren’t seeing ROI from Facebook ads. We’ve already hashed out that images with a lot of detail taken from far away do not resonate well with users on Facebook…. However, an image of a car stranded on the side of the road (albeit with indistinguishable characters) could work if the ad copy had something to do with State Farm’s roadside assistance or similar benefit, but the ad copy here is all about savings. The pairing of this image with ad copy is actually a bit confusing and could lead some to wonder: If I save money with State Farm will I then be stranded on the side of the road? Is that how they’re cutting costs & saving me money? Had enough big brand ad critiques? Here’s a rapid-fire, list of awesome ads and what makes them shake up the right column. Headline and body copy that is hard to say no to? Check! This ad is a gem and would pull at the heartstrings of many. Slight changes to make: enhance the colors of the image, or only the flag, to make it stand out a bit more and crop a bit closer to the cute kid’s face. What a killer right? Headline speaks to many men’s fears with close up image of a pretty, sultry lady, where you can see and feel the emotion in her face. California tourism board gets a shout-out for this one because it’s hard to capture large-scale in a teeny Facebook image, and its succinct yet fun copy is true to the brand. No doubt this was probably a difficult task to find images that portray kids and some sort of talent that would resonate in a 100×72 image. Samsung did a fantastic job choosing this image with the girl’s arms outstretched that fits in the image and still feel the emotion from her face. Bonus points because her shirt is pink which contrasts Facebook’s design. With ad images, Facebook marketers often have to take what they can get, including images that totally look “stock.” iBuyWineOnline has made the best of this by opting for an image with the face of the character in the image close to the thing (wine) they are trying to sell. Remember, when choosing images with people, the action they are doing, whether it’s a thumbs up, using a tablet, or, in this case, drinking wine, it must be close to their face or you risk losing the emotion of the character and making the action or thing too small. Big brands can #FAIL just as much as anyone else when it comes to Facebook advertising. Big names and a big budget doesn’t make you immune to lazy marketers who aren’t fully-leveraging the elements of a Facebook ad, namely the most important piece: the ad image. Take these lessons with you as you create your next campaign, and I hope to see your killer Facebook ads in my right-hand column!